Avail from us perfectly designed Quick Release Couplings (QRC). Sourced from the accredited vendors of the industry, these offered products are appropriate for carrying fluids, air gases and chemical in nematic and hydraulic lines. 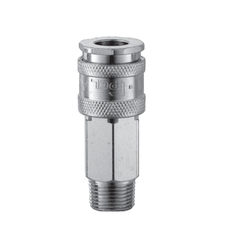 The offered products are extensively used on compressor and tool end of the hose so that air is contained when either the hoses are disconnected. Looking for Quick Release Coupling QRC ?